The Church is dedicated to St George. St George was born about 280 AD in Cappadocia (part of Turkey). He enlisted in the Roman army at the age of 17 and quickly rose through the ranks. At that time the Emperor Diocletian persecuted Christians because he feared political unrest. George stood up for the Christians, so he was arrested, imprisoned and was ordered to be tortured until he denied his faith. He remained strong in his faith and was beheaded near Lydda in Palestine in 303 AD. Welcome to Poynto n Parish Church which was consecrated by the Bishop of Chester, John Graham, on the 1st February 1859 and dedicated to St George, as was a previous Chapel on the site built in 1789. The Church was then in the Parish of Prestbury and the Curate was the Reverend Robert Litler. If you are new to the Church sit near the central aisle where you can take in a general view of the Church and reflect on the Christian witness that has taken place here over the last 150 years. One of the most striking features is the east window depicting the Gospel story of the Nativity, Crucifixion, Resurrection and the Coming of the Holy Spirit. Notice that Mary is featured in each section of the window. This supports the theory that the intention had been to dedicate the church to St Mary. There had been from the 15th century a Chapel dedicated to St Mary associated with the Hall in Poynton Park, the home of the Warrens, the lords of the manor of Poynton. Towards the end of the 18th century it was in a bad state of repair and the population was starting to grow because of the development of mining in Poynton, so it was decided to build a new church on the present site. This was paid for by George Warren and it was dedicated to St George in 1789. When, in turn, this became unsafe in 1857, architect J.S. Crowther was asked to draw up plans for a new Church. These plans are in the Lambeth Palace archive, and are lodged under the dedication of St Mary. Rev’d Litler was ill during the period leading up to the consecration of the new Church, so we think he failed to attend to the administration to have the dedication put in the name of St Mary. The deed of consecration produced by the Bishop on the day was to St George and so it remains the Church of St George. It cost £3500 to build, without completing the tower and spire. 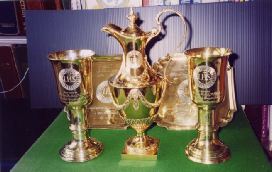 These were added in 1885 to a design by Medland Taylor when the £2000 loan had been paid off. To look at the interior of the present Church in more detail. Firstly, the two stained glass windows near the main entrance in the SW corner. One is the Mother’s Union window, made in 1935 by local craftsman Edwin Wright, in memory of Evelyn Baines who started the MU in Poynton and it depicts Mary with the Christ Child and her mother St Anne. The other dates from about 1900 and is in memory of Harriet Frances Maria the widow of Augustus, the 6th Baron Vernon, who had laid the foundation stone. At the west end of the main aisle you will see two pairs of warden’s staffs. The newer pair bear a crown and mitre, to show the connection between Church and state. The older pair of staffs date from William IV period so would have been in use in the previous Chapel. There is also a list of the incumbents since 1596. There was no incumbent during the latter part of the 17th century due to the civil war. On the north wall of the Church is a depiction of Holman Hunt’s “The Light of the World” done in natural materials. It was made by Brenda Potts in 1975 for a flower festival at the Baptist Church, but later presented to St George’s. A significant window is the Turner window in the NE corner, made by Aldham Heaton, who was friendly with Rosetti and Burne-Jones and influential in the Arts and Crafts movement. It was made in 1886 in memory of William Turner of Barlow Fold. He was involved in cotton spinning but also eminent in the Manchester art world, being a guiding force in setting up the Manchester Municipal Art Gallery, now the City Art Gallery. The altar table, lectern and font at the entrance to the chancel all date from 1998 when the choir stalls and pulpit were removed to make the church more flexible in its use and the altar to be at the centre of the communion service. Further reordering in 2012 replaced the hard wooden pews by more comfortable seating and improved the sound, lighting and heating in the church. In the chancel the Faith, Hope and Charity window dates from 1886 and is in memory of three ladies of the Garrett family who had been benefactors of the Church. The other window in the chancel shows scenes from Jesus’ childhood. 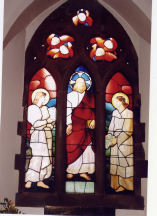 This window, together with the east window is by O’Connell, were presented to the Church in 1859 by Mr Hadwen, Lord Vernon’s agent and cost £330. Not on show, but a valuable asset of the Church is the Warren Bulkeley Communion Plate, presented to the Church in 1806 by the Warren Bulkeley family, the Warrens being Patrons of the Church at that time. The reredos behind the altar represents da Vinci’s “The Last Supper”. It was made in alabaster by a local craftsman, Alfred Darbyshire, for the Vernon’s home at Sudbury, but Lady Vernon presented it to the Church in honour of her husband’s appointment as a Privy councillor. Nearby you will see the Bishop’s chair, a brass eagle lectern presented to the Church in 1899 by the Everett family, a piscina (a sink running to consecrated earth) and a three cushioned sedilia where the seats are at different levels. An organ was installed in the Church by 1880 but the present one dates from 1965. It bears an inscription to Edward Dodd, a long serving organist from the 20th century. After the tower had been completed six bells cast by Taylor’s of Loughborough were hung in 1887 and were first rung on Easter Sunday of that year. They were rehung in 1936 but remain in Ralph Clayton’s original timber framing. The clock was installed by John Smith of Derby and struck for the first time at noon on 4th September 1887. In 1905 the choir vestry with the bier house underneath were added. The Churchyard was opened in 1840 but was not consecrated until 1859. A row of stones at the edge of the graveyard, parallel to the path to St George’s Hall marks the edge of consecrated ground and the alignment of the graves. 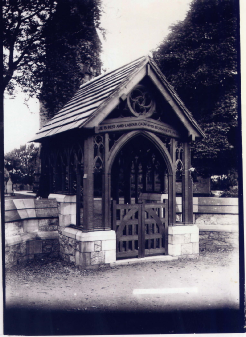 The Lych gate was built in 1908 in memory of the Reverend Thomas Bridge who had died in 1907. He had done much for the village, including bringing a doctor to practice in Poynton. The lych gate is where the coffin and bearers waited before the funeral service. Currently (2013) restoration work is planned for the Lych gate. The War Memorial is built on the site of an old bell-cote. It was unveiled by Lord Vernon in 1920 and is in the care of the Royal British Legion. 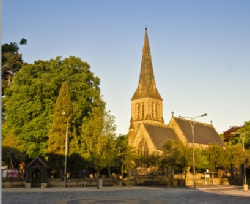 More about the History of Poynton Parish Church can be found in the booklet “The Church at the Crossroads”, obtainable from the Church Office.